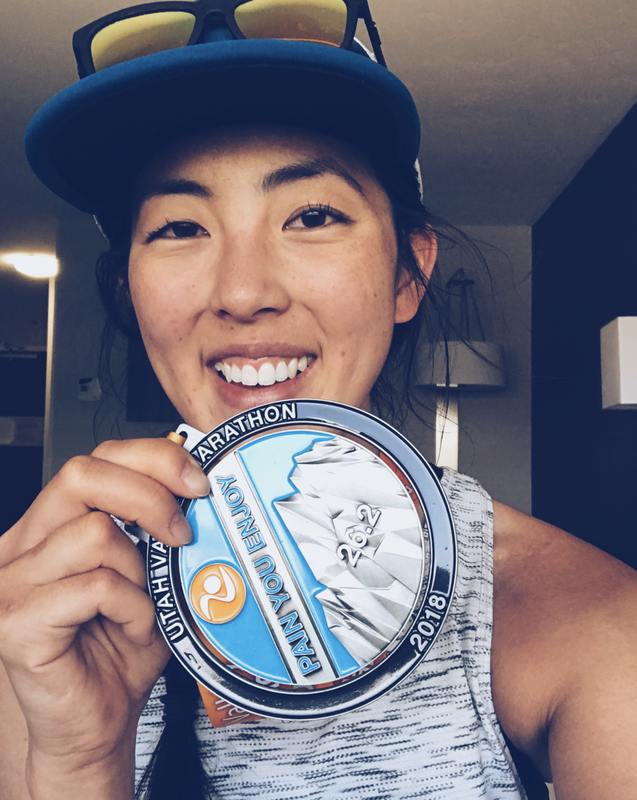 I ran the fifteenth anniversary of the Salt Lake City Half Marathon on April 21st and surprise!—got a half marathon PR. I wasn't expecting that at all and am so happy with how it went. The advantage going in was that this is my local race and I was really familiar with the route. I also ran this same half marathon back in 2015 (it was my second half marathon then) and had a good idea of the course. The day before, Geof and I went to the expo and grabbed our bibs and briefly visited the vendor booths (we tried some vegan hot dogs there!). The race made a mistake on my corral assignment and we had to stop by the race info booth to get it fixed. They looked up my estimated finish time and said they had messed up so they fixed it so I could start the race in the right corral. After the expo, we stopped at Walmart to buy throwaway hoodies for the start of the race and ate pasta from Noodles & Company for our pre-race dinner (the penne rosa is a staple!). Going into this race, I had zero goals. A friend asked me in the week prior if I had a time goal and I didn't. Lately, I had been doing a lot more slower runs and trail runs and hadn't been focusing too much on speed work. I went into the race without any time goals, just to run what felt good to me. The more races I run, the more I realize that going into a race with a positive outlook and not putting pressure on myself is how I run my best possible race. That's what happened for me during this one. 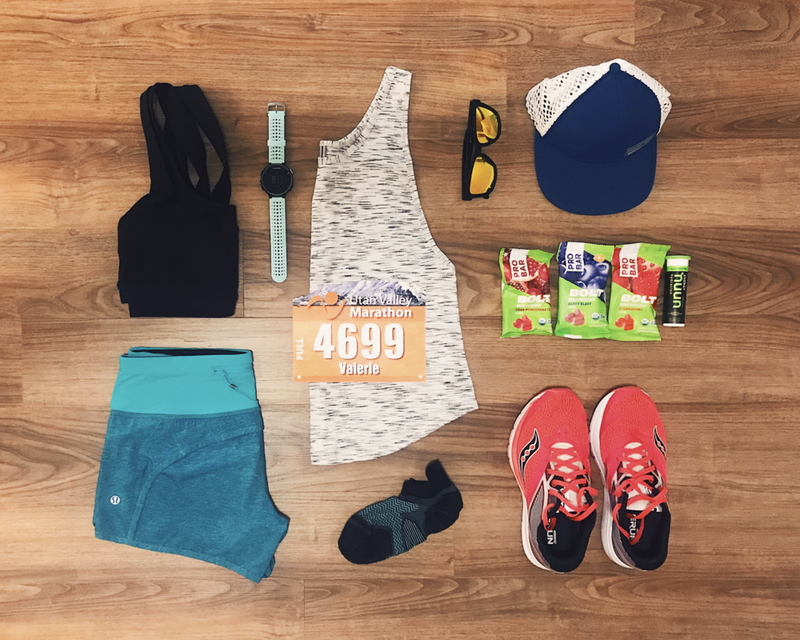 On race morning, I had my usual breakfast (avocado toast + nuun), got ready and we headed out the door. With our race bibs, we got a free ride on the TRAX light rail, so we parked at the ballpark and rode the train up to the University of Utah, where the race began. It was just slightly chilly but close to perfect race conditions for me. I like racing in brisk weather and it was a cool 45° at the start. We went to the port-a-potties and then warmed up on the school track. I loved that they opened it up for runners to warm up on. We did a lap around and then stretched and dropped off our gear check bag. I ended up gear checking my throwaway hoodie since the temperature felt nice enough. Waiting at the TRAX station. Lining up in the corral, I was so excited. The adrenaline starts to rise and the anticipation builds with the music and the announcer hyping everyone up. I retied my shoelaces and the national anthem was sung. Then the countdown began! The elites in corral A started right at 7 a.m. and then the following corrals started thirty seconds after the previous one. Geof was in B and I was in C, but he decided to start in C with me. He had a nagging foot injury so he made the conscious decision to stay back and run with me so he could slow down and not aggravate his foot further. Miles 1–2 take runners from the Olympic Legacy Bridge at the University of Utah, through the Federal Heights neighborhood and onto 11th Avenue. There are some small hills here but they're manageable and helped me warm up in the first miles. Miles 3–5 were fast. This is where most of the downhill is in the race and I used the downhill to my gain, allowing my feet to turnover quickly and bank some time. This part of the race was scenic as we took Memory Grove toward downtown. At mile 5, we headed east on South Temple, where we were hit with the sun and a slight uphill for eight city blocks (if you haven't been to Salt Lake City, our blocks are big, so six blocks = about a mile in distance). During miles 5–11, we snaked through the streets, passing through local neighborhoods. There was a hill at mile 7.5 (with a 6% grade) that had a water station a quarter of the way up it. I took a quick drink of water and then powered up that hill! I felt strong and while running, just remembered back to when I first ran this course in 2015 and how much more steady, consistent and stronger I was this time around, especially on all the hills! I was losing Geof on the uphills and then he would catch back up to me on the flatter sections. When he caught back up at 8.5 miles, I told him to not talk to me too much because I was in the zone (haha). Course elevation and my pace overlay. The dips are the short walks through the water stations. After mile 11, we entered Liberty Park. Geof and I run this park often but it feels so different during a race. I was still running on adrenaline and though it was getting warmer, I was still holding steady. I looked at my watch in the park and with 1.5 miles to go to the finish, did some quick mental math and noticed that at the pace I was going, I could beat my PR, so I kept pushing forward. We left the park at 12 miles and picked it up. Geof helped me here by offering words of encouragement. He started running faster to get me to go faster too. He believes in me so much and I couldn’t ask for a better person to be my biggest supporter. I was trying to get my speed up and was breathing harder, but knew I had it in me to keep pushing. We rounded one last corner at 12.7 miles and could see the finish line off in the distance. I ran hard down that finishing chute and knew instantly after crossing the line and looking at the clock that I did it! I had a new half marathon PR. Final chip time—1:48:37. After finishing the race, we were handed a medal and water bottle and then everything you could ever imagine. I kept walking through the finishing area and kept getting handed things: a towel, fruit cup, banana, flavored sparkling water, instant flapjack mix, granola bar, drinkable strawberry yogurt, an ice cream bar, chips and guacamole... it was so funny. Geof also got pancakes to eat but I didn't feel like grabbing that. The race also did free medal engraving at the end. It was so fun and commemorative to get my time engraved on the back, and felt extra special with it being a new PR. 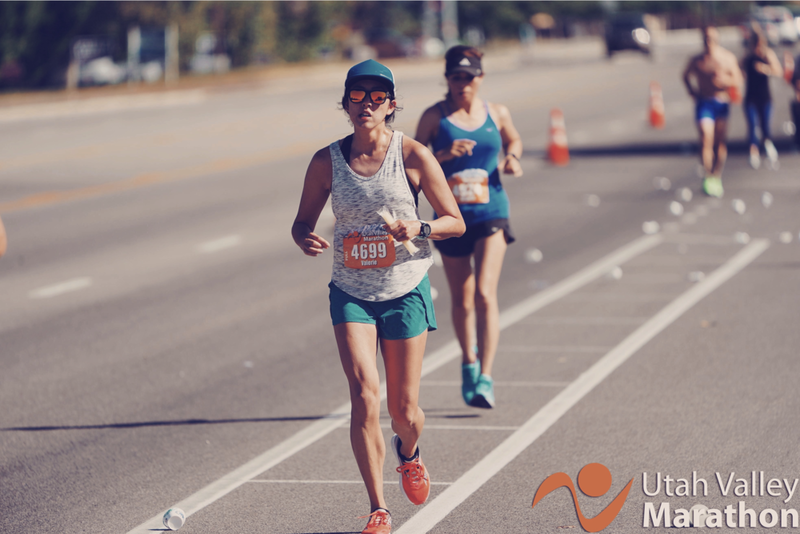 I loved this race but being that I live in Salt Lake City and run so many portions of the course already, I don't think I have the desire or need to run this race too often. I'm really just so happy that everything fell into place that day and I'm ecstatic with a surprise PR. It makes me hopeful for what this year will hold! I was feeling a little down with how running was going at the start of 2018 (with getting sick and running less), so I slowed it down and did more trail running because that's what makes me happy—but after this race, I feel so much better. I'm more confident in my ability and know that I'm making progress in my training, no matter how small. There will always be setbacks but part of training is overcoming them. I have two major races coming up this year (a road marathon in June and a trail 50K in November) with some half marathons and smaller races thrown in there too, so I'm excited to see how it all pans out.